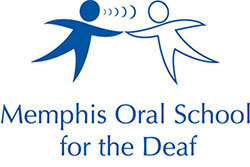 Memphis Oral School for the Deaf : News & Events : Blog Entries : Baptist Memorial Health Care Staff Donate More Than $1,200! MOSD Parent, Jesse Demastus, and team of staff members from Baptist Memorial Health Care presented Memphis Oral School for the Deaf with a donation of more than $1,200 in March! Demastus helped organize a "Soup"er Bowl potluck fundraiser in honor of son, Dylan, who attends MOSD. The department-wide fundraiser helped to spread awareness of childhood hearing loss and the early intervention programs at MOSD. Community support like this helps each child at MOSD reach their full potential in their hearing loss journey. Thank you for supporting our mission to Empower Deaf Children to Listen, Learn and Talk!